NFL Combine, one of the three big events in the NFL offseason, took place in the Lucas Oil Stadium, Indianapolis from 27 February to 5 March. Fans and Scouts of NFL teams got a look at their favorite prospects in action and were able to analyze their physical and mental attributes. Some of the prospects put on a show at the combine with some blistering performances in the drills, reminding the NFL franchises why they are considered the best football players in the country and why they deserve to be drafted ahead of everyone else. NFL has always had its fair share of feel-good stories where athletes fight against all odds and make their dreams of becoming a pro-footballer come true. Well we might be in for another one of those stories when Shaquem Griffin the linebacker out of UCF arrives at the Lucas Oil Stadium in Indianapolis for the NFL Combine. Football is one of the toughest and most brutal contact sports in the world and even an extremely fit fully-bodied person might find it tough let alone a guy with an amputated left hand but that did not deter Griffin from pursuing his dreams of playing pro level football. Initially not invited to the NFL scouting combine. Griffin received a lot of support from people all around the country and even more during the Senior Bowl causing the NFL to reconsider their decision and allow Griffin in as late entry. 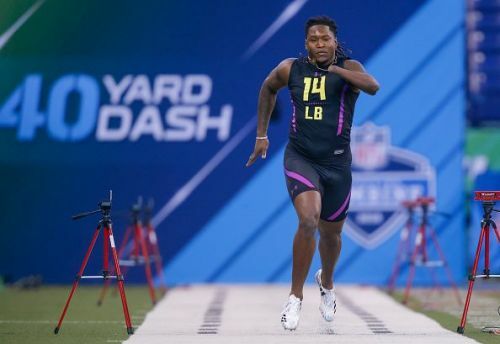 He came to the combine a man possessed and started off in brilliant fashion registering 20 reps on the bench press with help of a prosthetic hand showing off his upper body strength, then on the field he blazed off to a 4.38s 40-yard dash to register the fastest time ever by an LB at the NFL combine. He also recorded a broad jump of 9.7 feet. According to some scouts, Griffin may have upped his draft value to the 3rd or 4th round with this performance.